This is a fairly aromatic dish so an aromatic wine comes in nicely. We tried this one with a simple Alsace gewürztraminer (good structure and neat perfumes but still quite light and fresh with almost no residual sugar). The freshness of the wine contrasted the richness of the rice and pork, the aromaticity accompanied seafood well, whilst the structure was holding well to the meat. Peal and chop finely the onion and garlic. Blanch the tomatoes, peal them, remove the seeds and cut in rough pieces. Cut the meat into pieces around 1 inch square (if using chicken legs keep whole). Heat up the oven at 100°C to keep the reserved ingredients warm. Start to heat up the stock. Clean the mussels, discard opened ones and put the closed ones in a large saucepan. Put over high heat to make all the mussels open up (around 10 minutes), then remove from the fire, filter the liquid the mussels released and add to the heating stock. Select the bigger shells and separate the two halves keeping those with the flesh, for the smaller ones discard the whole shell and keep only the flesh, keep warm. In the meantime heat up two tablespoon olive oil in a pan over high heat. Put the chicken in the hot oil and stir until golden, add ground pepper to taste, remove from the pan and reserve warm; do the same with thee pork meat. Put the prawns in the pan, stir until all sides have taken on red colour, reserve warm. Keep the reserved ingredients in the warm oven covered with foil so they don’t dry. If necessary add extra oil to the pan, reduce heat and put the onion and garlic in the condiment, stir until the onion turns golden. Add the peas and tomatoes and stir 5 minutes to mix all ingredients. Add the rice and mix well, dilute the saffron in a ladle of broth and add to the rice, stir well, turn the heat under the pan to maximum and add broth, bring to the boil and reduce heat to simmer, put the laurel leaf in the rice. Add broth bit by bit, as the rice absorbs it and it evaporates add few more ladles, proceed until the rice is fully cooked (this should take around 20 minutes, depending on rice). When the rice is finishing cooking remove the reserved ingredients from the oven and turn on to high heat (200°C). Once the rice is cooked remove the laurel leaf and place over it the different reserved ingredients and lemon quarters. Cover with foil and place in the hot oven for 10 minutes. The pan for cooking the rice should go on the stove and in the oven. The traditional Spanish paella is earthenware but any all-metal frying pan can do the trick (actually for the one in the picture we removed the screwed on plastic handles). If you don’t have one you’ll need to transfer the rice to an oven dish. 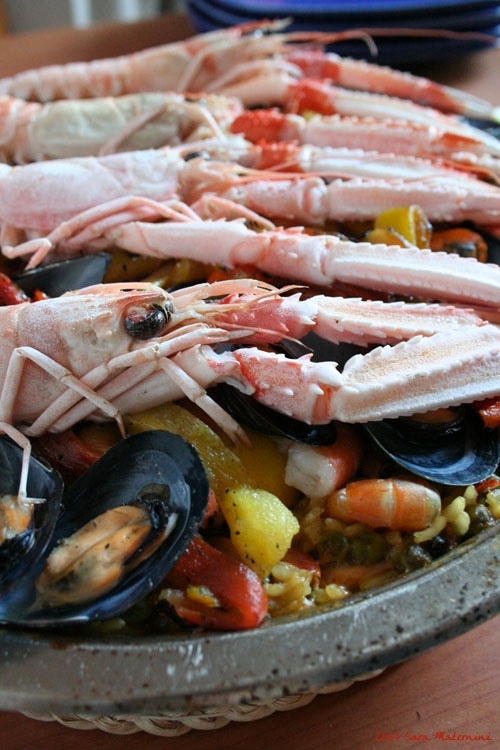 Paella can be made in all sorts of versions with different seafood (scampi and squid are favourites) and meat, or some spicy hot chorizo for a more fiery version; in Catalonia it actually also comes with snails. You may also use a variety of vegetables for a vegetarian solution. I hope he’s of Spanish origins, this husband of yours, but it definitely looks tasty…à essayer sans aucun doute. @Hilda: he’s French and not a single drop of Spanish blood! Saw this post on tastespotting.com… Nice recipe! My origins are French-Spanish (hence mon nom: André Sala), so I really appreciate making a Paella with French sensibilities. – I add roasted bell pepper to the sofrito sauce base, but never add onion. – I always include scallops and calamari squid. – I let the mussels cook in the paella. After adding my broth to the rice I arrange the live mussels aesthetically around the top of the dish, hinges down, and let them cook while the rice cooks. This way they release their delicious ocean juices into the rice while it cooks. I almost always serve with a well-balanced Muscadet. Oh! One more thing — what is your husband’s rough rice to liquid ratio? I’ve found that this varies intensely from recipe to recipe. My father claims that 2.5:1 is correct, but I find that generates very soggy rice… I always start with 1:1, and add little by little if it feels dry. And I always want it to be dry for the last two minutes when I crank up the heat until I can hear the rice cracking from the bottom of the pan, forming the delicious socarrat! Wow, the main photo of the king sized prawns are awesome. @ Andrè: I never actually measure exactly how much broth goes in. I make lot and then add it little by little until the rice is cooked and the last bit of liquid has evaporated. The time in the oven then dries the dish a little bit further. Very nice picture. It looks great! If you have a chance to come in Paris, you have to try the spanish restaurant Fogon. I adore their rice. @ eatdrinknbmerry: I think those “king sized prawns” are actually langoustine. Yum yum yum. Love it when men cook! Looks great but you’re still the Queen. Laurel leaf? I know edible varieties exist but surely the common laurel, at least in the UK, is extremely poisonous. Do you mean bay perhaps?